It takes a hefty machine to handle the trials and tribulations of bouncing between gnarly downhill and steep technical enduro, which is why the Giant Reign 2 Complete Mountain Bike is built burly. A 170mm Rockshox Yari fork leads the way, combined with 160mm's of Maestro® suspension to fire up the party in the back. Climb, transition and descend in a flash thanks to smooth Shimano Deore shifting and Giant s in-house designed dropper post for quick riding position changes. 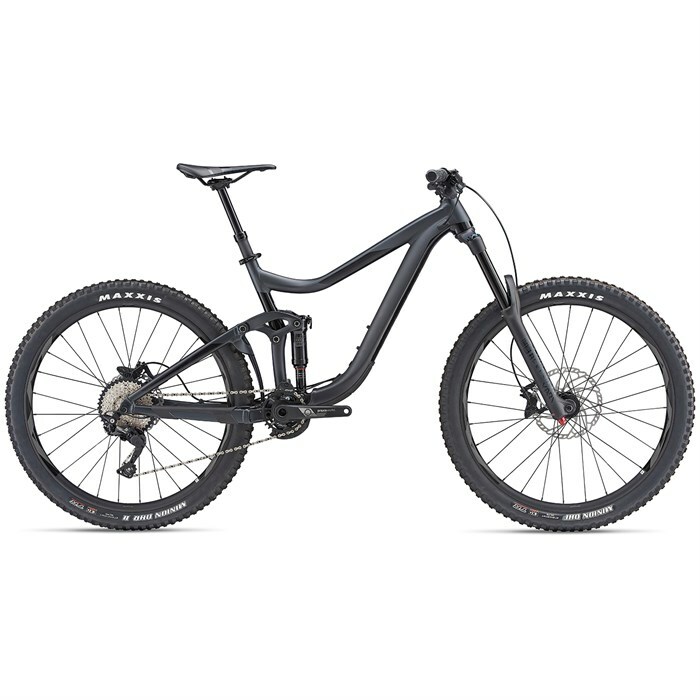 Make every ride one for the ages with this enduro warrior, the Giant Reign 2 Complete Mountain Bike. ALUXX SL Aluminum Construction  Extremely lightweight framesets featuring high-performance strength-to-weight ratios, predominantly featuring 6011 alloy. A heritage of craftsmanship combined with unmatched manufacturing capabilities gives Giant the unique ability to monitor every step of the aluminum frame-building process. Through Giant's cutting-edge materials science, proprietary forming techniques, and attention to detail, we are constantly advancing aluminum performance to create bikes that are lighter, stronger and stiffer. The difference can be felt in the ride. Every aluminum bike bearing the ALUXX Aluminum Technology label must live up to the highest standards and meet the tightest tolerances of any aluminum frame in the world. Advanced Forged Composite Upper Rocker Arm  A state-of-the-art high-pressure molding process is used to produce complex-shaped carbon fiber components that are lighter, stiffer, and stronger than similar components made from aluminum. This technology is used in critical performance parts such as Maestro Suspension rocker links. OverDrive  OverDrive provides up to 15 percent more torsional steering stiffness than straight steerer-tube designs. This translates into much more accurate steering input from a rider's hands, through the handlebar and stem, and down to the front wheel. Whether hammering uphill or carving through a corner, OverDrive transmits input directly to the front wheel for more precise handling. Trunnion Mount  The latest Giant off-road models feature updated Maestro Suspension systems with a new Trunnion Mount shock and Advanced Forged Composite rocker arm. The Trunnion Mount allows for a longer shock shaft, which produces a lower leverage ratio and smoother ride performance. It also allows for shorter chainstays to improve quickness and agility on the trail. The Advanced Forged composite rocker arm weighs less than the previous aluminum version while being stiffer and stronger. Together, these innovations result in the following core benefits. 160 mm Maestro® Suspension  Whatever off-road adventures you seek, Giant's Maestro Suspension helps you make the most of your efforts. Control, traction, comfort, speed -- you get more of everything with Maestro. From fast and efficient XC bikes to long-travel downhill setups, Maestro is an adaptable full-suspension platform that offers smooth, active rear suspension for any type of trail and all kinds of terrain. 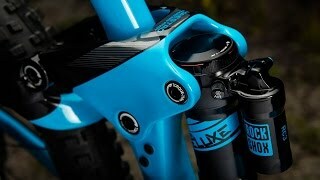 RockShox Deluxe RT  How do you improve on the success of a rear shock that has received critical acclaim for its stellar performance and supple feel? It’s simple. You rewrite the rules, throw existing design constraints out the window, and focus solely on the best possible performance solution. We took the proven damping performance of our popular Monarch series and introduced it to our new metric-sized chassis. The result is truly Deluxe, ready to redefine your ride. Shimano Deore Shadow+ Derailleur  High-efficiency drivetrain for aggressive trail riding. Optimized gear combinations and ratios for trail riding. Compatible with wide range cassettes. Silent and stable during technical trail riding. Improved stability and chain retention longevity. Maxxis Minion DHF Front Tire  With a tread design that deftly balances rolling speed with braking and cornering traction, it's hard to find fault with the Minion DHF. That's probably why it's one of the most imitated tires in mountain biking. Maxxis DHR II Rear Tire  With side knobs borrowed from the legendary Minion DHF, but widened to provide more support, the DHR II corners like no other. The center tread features ramped leading edges to improve acceleration and sipes to create a smooth transition when leaning the bike. Paddle-like knobs on the center tread dig in under hard braking and help keep the bike under control. Pair it with a Minion DHF up front for the ultimate aggressive trail riding tire combo! Giant Contact Switch Dropper Seatpost  Trail conditions change in the blink of an eye -- transition from steep climbs to gnarly descents and never skip a beat with the all-new Contact Switch seatpost. Front Tire: Maxxis Minion DHF WT 60tpi EXO TR | 27.5 x 2.5"
Rear Tire: Maxxis Minion DHRII WT 60tpi EXO TR | 27.5 x 2.4"